We were in the kitchen, whacking each other with meat mallets. Grandma was in the other room, watching TV. “Get in here, you kids,” she said. We ignored her and continued our pro wrestling routine. I was Captain Lou Albano. My little brother was “Rowdy” Roddy Piper. Grandma liked Cyndi Lauper almost as much as we did. In her youth, she’d been a flapper (and boogie-woogie piano player), and still had bobbed, red hair. I think she saw her younger self in Cyndi: rebellious, fun-loving, dressed in quirky clothes. We stared at the TV as Cyndi swung over the audience in a trash can belting out “Money Changes Everything.” The energy, the voice, the blaze orange hair…it was all just incredible. “Look at Carrot Head go!” said Grandma. Track nine of Cyndi’s debut solo album, She’s So Unusual, is an abbreviated cover of the 1929 Helen Kane hit “He’s So Unusual,” a song Grandma actually remembered. It was risqué in its day, just as Cyndi’s ode to masturbation, “She Bop,” would be fifty-five years later. At the time, we had no idea what “She Bop” meant. Grandma told us it was some kind of new dance. 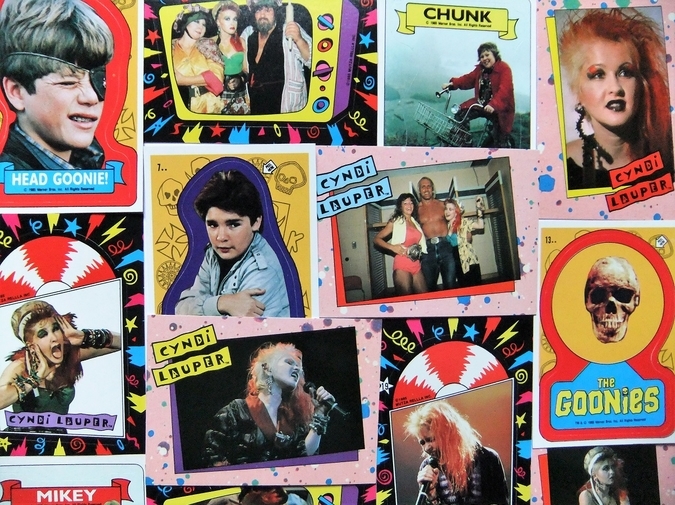 I had She’s So Unusual on tape and record, and even collected Cyndi Lauper trading cards. When The Goonies came out in 1985, featuring a cameo and new song (“The Goonies ‘R’ Good Enough”) by Cyndi, I went bananas. God knows how many times I made Grandma watch it on video. Of course, I had all the Goonies cards too. Grandma died in 1987. I discovered baseball cards that year, and Cyndi and the Goonies were relegated to the attic. Nowadays, when I’m feeling sentimental, I’ll watch the “Girls Just Want To Have Fun” video on YouTube. I swear I see Grandma in that crazy conga line, bopping away to the beat. Drink: Grandma liked a stiff whisky highball. Virginia Slim optional. Dan Morey is a freelance writer in Pennsylvania. Look for him at the Cyndi Lauper/Rod Stewart concert this summer in Pittsburgh. He’ll be wearing a Goonies shirt. His website is danmorey.weebly.com.